Online entry closes at midnight on Thursday, November 29th, 2018. Note registration may close earlier if we reach our 1500 limit before this date. REGISTRATION HAS NOW CLOSED. We have reached our maximum capacity and unfortunately there will be no on the day registrations. 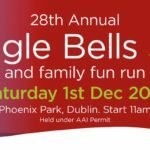 The race takes place on Saturday December 1st in the Phoenix Park and will start at 11am sharp. The start is located midway on the Acres road about a 5-10 min jog from Donore Harriers’ clubhouse. (Startline approx GPS location: 53.351596,-6.329145) (A link to the course map is at the bottom of this page). Allow yourself plenty of time on the morning of the race and be aware of restrictions in place. We strongly advise that you travel to the race by public transport or carpool where possible. Please note that there are correctly works underway in Castleknock village. If travelling by car from the North West direction. The Navan Road, Ashtown Gate and the North Road/Odd Lamp Road within the Phoenix Park would be the best option for getting to the Race. Parking is very limited within the Phoenix Park. There is no parking along the course of the race and there is strictly no parking at or near the start and finish areas of the race. There is no parking on the North Road, The Odd Lamp Road, Military Road and Chapelizod Road. There is also no parking available in Donore Harriers’ carpark on the morning of the race. There is parking available at the Garda Boat Club on Chapelizod Road, GPS location 53.346322,-6.321898 (Allow 25 mins to get to the startline). Parking is available at the Papal Cross Carpark and we recommend parking along Chesterfield Avenue, AWAY FROM THE COURSE, from the Phoenix Monument down towards Dublin Zoo only. There is also limited parking available in the Phoenix Park Visitor’s Centre (Allow 15-20 mins to get to the start line) and limited parking in the carparks off Military Road. Road closures, traffic restrictions and gate closures will be in place from 7am. Chesterfield Avenue will be closed between Mountjoy Cross Roundabout and the Phoenix Monument from 7.00am – 12.30pm. Ordnance Road will be closed from 9.00am – 12.30pm with access to Farmleigh ONLY from Chesterfield Avenue. All other traffic coming from Castleknock gate will be diverted left to the North Road (road towards Ashtown gate). The Acres Road and The Upper Glen Road will be closed from 9.00am – 12.30pm. Diversions will be in place. The Odd Lamp Road (North Road – The Phoenix Monument) and Military Road will be open to traffic. Please note that Chapelizod Gate is entry only with restricted access and Islandbridge Gate is exit only to vehicles. If you entered up to Friday November 23rd you should have received your number and timing chip in the post along with this leaflet. All other pre-entered participants will need to collect numbers from our clubhouse either on Friday November 30th from 12pm – 7pm. or on the morning of the race between 8.30am and 10.15am. We would encourage you to try collect your number on Friday if possible. Our clubhouse is located on the Chapelizod Road, almost opposite the Chapelizod Gate entrance to the Phoenix Park, (GPS location: 53.346327,-6.338321). THERE IS NO NUMBER COLLECTION POINT AT THE START OR IN THE PHOENIX PARK. THERE IS NO NUMBER COLLECTION POINT AT THE START OR IN THE PHOENIX PARK. Your race chip is attached to the back of your number. Please do not remove your chip from your number, failure to wear the chip properly means no Time or Place will be recorded. Also please ensure to wear your number pinned to your front. The race will start promptly at 11am. The start of the race will be divided into time zones, please adhere to these time zones. If you are a jogger, walker or taking part with children please do not line up at the front of the race. Walkers and participants with buggies must start to the rear. Please be mindful of other participants and please adhere to the instructions of Gardai and stewards along the course. Once you have crossed the finish line please proceed forward to collect your race gift. Water will also be available at the finish. Note: We will be giving some goodies out at the end of the race to children. If you are a parent or guardian and would prefer if your child did not receive certain food items that is your responsibility. The distributor may also seek your permission before giving to young Children. We advise that you arrive race ready. There will be a limited baggage facility close to the start area suitable for storing light gear only. Donore Harriers will not be held responsible for any missing items and please do not store any valuables. Limited showers and changing facilities are available in our clubhouse. Please be aware however that the dressing rooms are unsupervised so we would advise you not to leave any valuables or money behind. While we take every possible precaution, it is a condition of race entry that Donore Harriers and Donore Harriers’ members are not liable for any loss of money or damage to personal property sustained by race participants. Portaloos will be located close to the start area. Prize giving and refreshments will be available in our clubhouse after the event. We kindly ask you respect the Phoenix Park. Please refrain from parking on grass areas and please put your litter in bins where provided. We look forward to seeing you all on Dec 1st. We wish you a great race and a very enjoyable day.